Ang Temba called us from his lodge at Pangboche this morning. 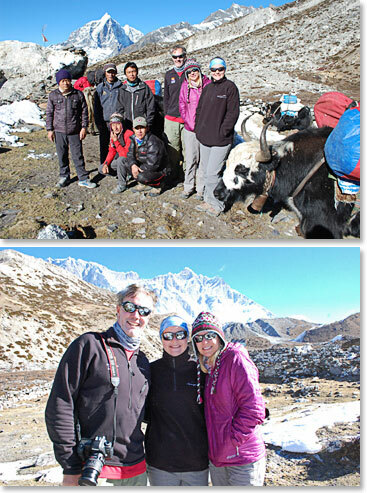 Keely, Alyssa and him have returned to the comfortable home that Temba and his wife Yangzing run in Pangboche, the “Highland Sherpa Resort”, after their successful trip to Everest Base Camp. We know that the showers and Yangzing’s meals must be great. Yesterday the team left Scot and climbing Sherpa Sandu Dorjee, along with their staff at Chukung. Scot and his summit team will continue on to try to reach the 20,300 foot summit of Island Peak. Temba said that Scot looks strong and that the team may go tonight to try to reach the top! Scot’s climbing Sherpa for Island Peak is Sandu Dorjee, four time summitter of Mount Everest. Sandu knows Island Peak well and will be an excellent guide. A farewell at Chukung! 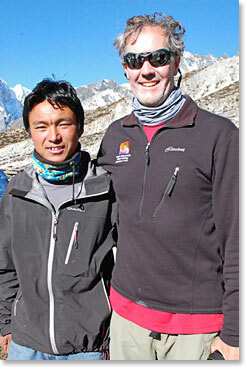 With luck the team will be reunited in Pangboche after only two nights. Scot and his Berg Adventures team. Ready for Island Peak.